I can't say I'm a fan of big events in comics. It's not that I hate them; it's just that I mostly can't muster up the emotional investment to even really get excited about them as early as they're announced. I'm aware this isn't the common mentality among comics fans, but that's the way it is with me. I still haven't read Secret Invasion, barely remember anything about Civil War, have no idea what in the world Fear Itself was about, hated Genesis, and so on and so forth. But one set of big events I always end up tuning into is whenever the DC Multiverse is involved. I love the very concept of parallel worlds and the idea of doubles on other earths. 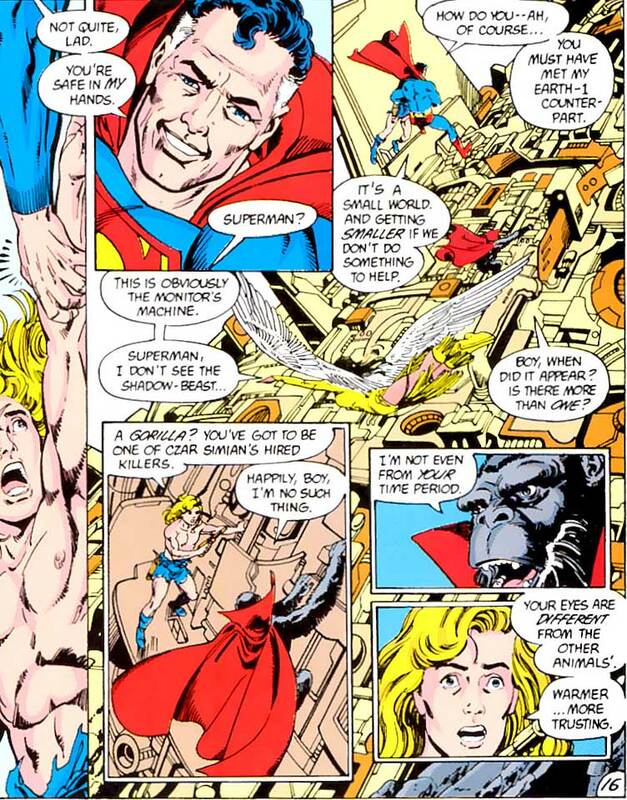 To this day, Crisis on Infinite Earths is my favorite comic book event. That's not nostalgia—I didn't read the entire thing or even most of it until I was 14. (My first real big event was Infinity Gauntlet, which I still love. That's nostalgia.) 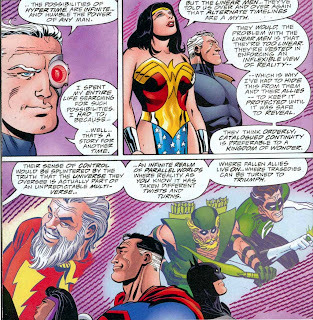 It starts off with a great character moment in the Crime Syndicate, the evil Justice League from Earth-3, sacrificing themselves to stop a wave of antimatter from destroying their planet. That's Ultraman, finding his nobility in the last moment of his life. The story just gets wilder and crazier from there, because we're treated to a bunch of—I hate to describe it this way, but I will anyway—random combinations of characters to stop a threat, until it's time for the next threat and the next random combination of characters. 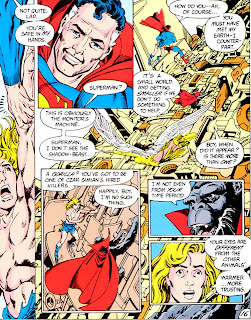 What sense does it make to have Earth-2 Superman, Kamandi, Dawnstar, and King Solovar all on the same team? None! That's what I loved about it though. Crisis was so huge, so expansive that it, more than any event ever, just made me want to discover more of the entire DC Universe. The random combinations and the spotlights on second- and third-tier characters (Arion, Lord of Atlantis! The Forgotten Heroes!) just made me want to read more stories with these characters. Supergirl met her death in the seventh issue and it was so well done that it just made me want to read more Supergirl stories, which I guess is counterintuitive because this killed her. 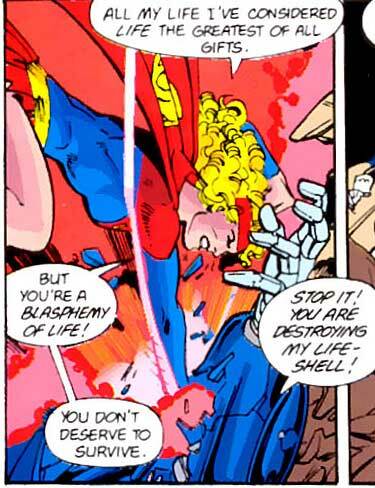 But that Supergirl thing is kind of a microcosm for the rest of the series. You know how sometimes you love the concept of a piece, and hate the execution, and you think it's a wasted opportunity? For me, that's War of the Gods and Speeding Bullets just off the top of my head. Well, Crisis is the exact opposite. The whole story is about "cleaning up" the DC Universe, because all of the continuity problems were deemed to be hurting DC's sales, and all the continuity problems were blamed on the multiverse. For example, Barry Allen, the Flash of Earth-1, was inspired by reading a comic about Jay Garrick, the Flash of Earth-2. But both Earths have a Superman, and in both Earths, Superman is Clark Kent, so shouldn't everyone on Earth-1 know that Superman is Clark Kent, if comics about Earth-2 Superman existed on their Earth? The idea was that the multiverse is confusing, and readers needed to keep a scorecard of who was on which earth. It's, I'm sorry, really stupid. Beyond it being really nitpicky, you end up with what Alan Moore says is "a situation far less defined and precise," because now, instead of just knowing what the history of your universe is and trusting discerning readers to dismiss the discrepancies as that which they actually are (mistakes), no one actually knows anything. And here's another reason. I didn't read Crisis until I was a teenager, this is true. But I was four years old when my brother was bringing home the Who's Who comics in the wake of Crisis, where he was explaining to me the differences between Earth-2 Superman (also known as "old Superman") and Earth-1 Superman (also known as "our Superman"), and how the Flashes were completely different people on two Earths but Batman was Bruce Wayne in both Earths. I was four, my brother was nine, and we got it. Twenty-one years later, as I was lying down in a hospital bed, recovering from surgery, my nephew read the Absolute Edition of Crisis on Infinite Earths, and he got it. He was eight years old. He didn't get all of Crisis, but it wasn't the multiverse that confused him. It wasn't confusing to us as children, and I don't understand how it could be confusing to an adult audience. I would actually go so far as to say that people who found the concept confusing are probably the same people who are just averse to the fact that DC had a decades-long history at all. There's nothing wrong with that, but that didn't change by getting rid of the multiverse, and in many ways it was more confusing, because they decided to say that some things before the multiverse ended stuck, and others didn't. If you needed a scorecard before, you didn't need one less now. But confusing? I don't see it. Look, here's a one-panel explanation! 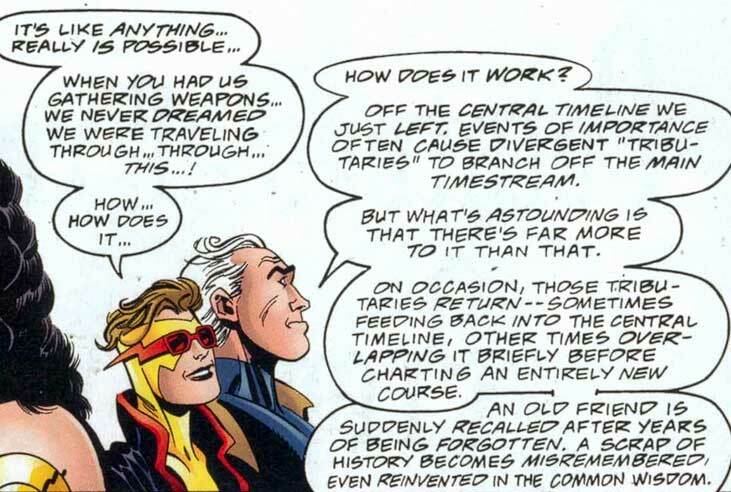 In the years since, they've tried several times to reintroduce the concept of the multiverse, starting with 1994's Zero Hour. They didn't really push through with it, as they more brought it back only to get rid of it again, but if it proved anything, it was that there were many stories possible when the concept is used as a springboard. 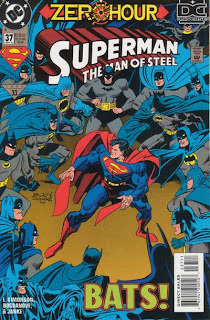 In the meantime, DC introduced the Elseworlds imprint for alternate reality stories, but those alternate realities never crossed over with the main universe, or even with each other. There was a huge sense of segregation there, and what was the point of it, I wonder? Who wouldn't want to see Russian Superman hang out with Vampire Batman? They tried doing something about that in 1999 with Mark Waid's The Kingdom, the unfairly panned sequel to Kingdom Come. Here they introduced the concept of Hypertime. What is Hypertime? 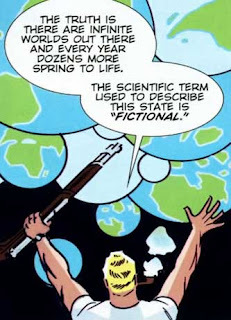 Here, let Rip Hunter explain it to you. So, essentially, it's a way for all stories to have "really happened." It's also essentially the same thing as parallel worlds, only it's parallel times. (Oh, don't look at me like that. For functional purposes, it's the same thing.) But what about the continuity nuts who want clear, ordered timelines? Hypertime didn't really take off for a number of reasons. For one thing, The Kingdom wasn't very well-received (I really just think it's because everyone expected Kingdom Come 2 and got something totally different. 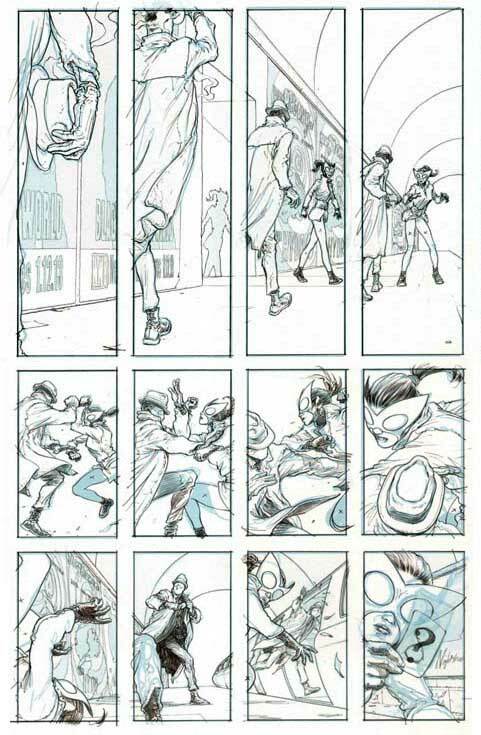 ), and I think there were editorial constraints preventing a return of a multiverse in any form. There were a couple of stories that used Hypertime in Superboy and Titans, but it just kind of disappeared and was never mentioned again. It's a shame because this was even more expansive than the original multiverse, where everyone hung out with parallel versions of themselves, but from the same time period. Over here, you could easily have regular Superman hang out with any of these other Supermen. Then 2005 and Infinite Crisis happened, and it was a sequel to Crisis on Infinite Earths, and you can't do a sequel to Crisis without using the multiverse. So they did, but this time, they had it stick. One year later, at the end of the weekly series 52, it was revealed that Infinite Crisis gave birth to a multiverse of 52 universes. Some were approximations of the original, pre-Crisis multiverse Earths. 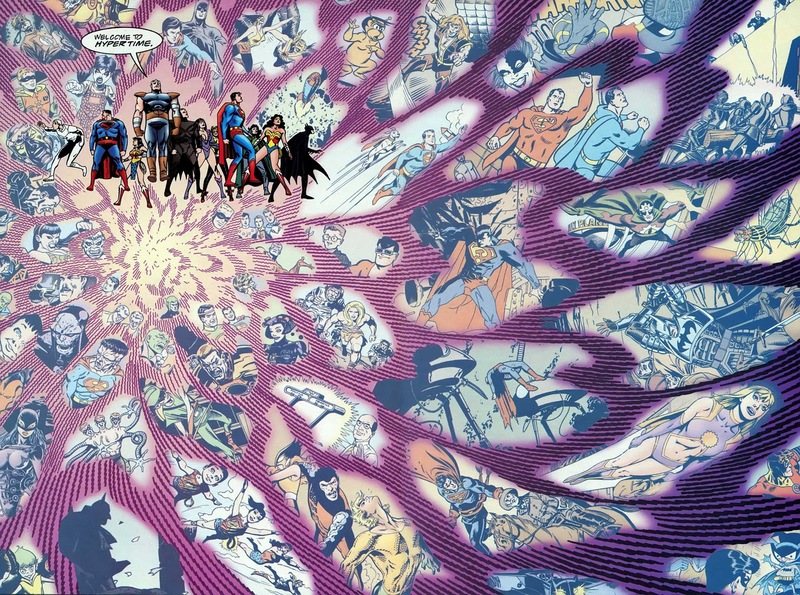 DC tried to capitalize on this right away with Countdown to Final Crisis, and Final Crisis itself, but they still seemed hesitant to actually make the multiverse as big a part of the DC mythos as it used to be, and the stories that used these worlds didn't really feel special (in one case, Countdown: Arena, it felt like filler). Of course, with the reboot last year, we got a (mostly) fresh start, and James Robinson and Nicola Scott's Earth 2 shows that a multiverse is back. Still—and I only read the first issue of Earth 2, so this is in no way an impartial judgment—something seems to be missing. I don't know what it is. It almost feels like in their attempt to make Earth 2 fit in with the rest of the DCnU, it became homogenous with it, with tragic origins and a lot of pathos. I loved the idea of multiple Earths with different temperaments. So I guess this is really a big preamble to me saying that I'm really looking forward to Grant Morrison's Multiversity next year. Eight issues long and spanning six different Earths, it will treat each universe as different in tone and structure. 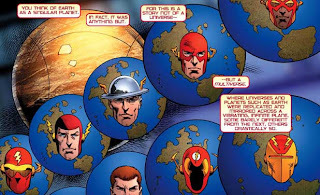 Among the worlds featured are an Earth where Superman is black and the President of the United States (already seen in Action Comics #9), a new version of Earth X where the Nazis won World War II, and a story set on Earth-Prime (that's here; the real world); and a world where the Justice League's kids is the focus. But I'm most excited for two things: a Captain Marvel–centric Earth called Thunderworld (yay!!) 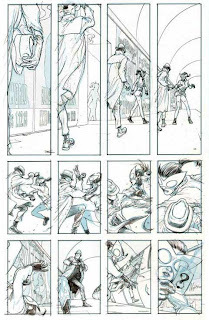 and Pax Americana, the Earth with the Charlton heroes, where Morrison and longtime partner Frank Quitely do a tribute to the spirit of Watchmen. Hey, it's a creative challenge, and I'll appreciate the effort. To have Superman and he's a black guy from Earth-23, the fifth issue where he's a Nazi from Earth-10 and the other ones where he's a completely different character -- I think this one, for me, is the big spread of what DC can do, and playing with that idea, which is fundamental to superhero comics, of the version. There's classic Superman, diet Superman -- those things! [Laughs] I think when you put all those versions together, you get this massive, amazing composite of what Superman actually is and all the possibilities in the character. So it was to do that on a wider scale with the entire universe and say, "This is why the DC Universe is so amazing." You can spin it off in ten different directions, and it still makes sense, it still got its integrity and it still makes sense in relationship to the New 52 universe, which is the core universe. And that's it, really. It's big. It's wild. It may not make total sense, but it makes enough. And of course, at the end of the day, it's a world of possibility. It's a world of wonder. Here's Rip Hunter (because, apparently, he's the spokesman for all versions of the multiverse) to close this one out. The problem, especially now in the age of Event Comics (which I like when done right--most aren't) is twofold. First, these other worlds are basically forced to crossover and interact with the main universe, often at a pretty regular pace. 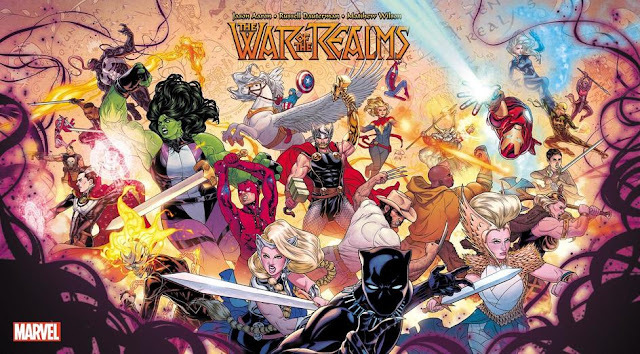 Either main universe heroes are stumbling into the alternate worlds and having adventures that directly impact Events, or else the Event is somehow also affecting the other universes. The other big problem is sales. With a multiverse, you run the risk of these various books having poor sales and/or a very niche market. Those books might be good, or even great, but they might not attract the same number of readers that they would if they were connected to the main universe. Again, see Billy Batson and the Magic of Shazam! 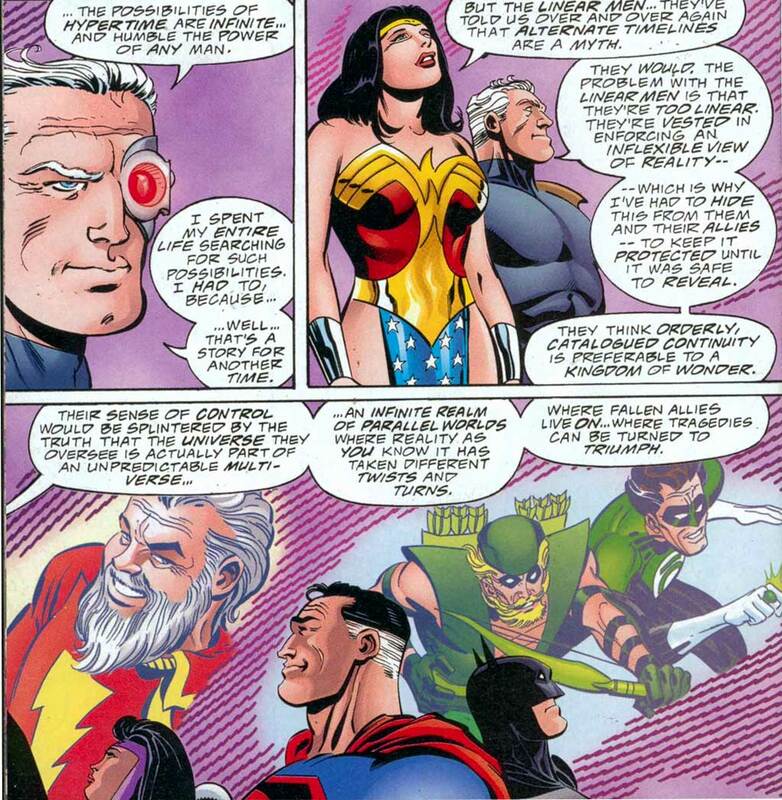 But really, my biggest objection to the multiverse is the fact that it's DC trying to run it. If the giant clusterf*ck that was Infinite Crisis and its build-up taught me--besides the fact that DC is intent on ruining or killing every character that I enjoyed (Captain Marvel, the Teen Titans)--it's that DC can't make one universe and its books coherent and relevant, let alone several. I predicted back when they brought the multiverse back that they would be forced to undo it within a few years. Called it.